The Highlands, a sought after property that sits along the highest elevation of Tagaytay has a distinction of having gorgeous 360-degree views, a relaxing chilly climate and proximity to the club amenities. The Midlands is a bird sanctuary with themed enclaves inspired by architecture and culture from different countries, thus, creating a picture of a truly international community. 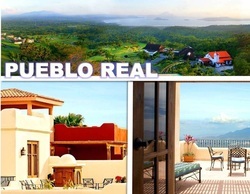 PUEBLO REAL IN TAGAYTAY HIGHLANDS | Master-planned to preserve the natural lay of the land, Pueblo Real's eco-friendly design will create a place where wellness-centered living could thrive and adventure would be a daily pursuit. The architectural styles of the village will be a wonderful expression of beauty and functionality. Landscaping appropriate to the area will be used to enhance the villageâ€™s Old World charms. Tall palm and coconut trees and colorful bougainvillea will capture the eye as sinuous streets lead to attractive houses in terracotta and vibrant shades. Master -planned for wellness and adventure. Master -planned to preserve the natural lay of the land and the existing lush vegetation in the area, Pueblo Real's eco friendly design will create a place where wellness-centered living could thrive and adventure would be a daily pursuit. Running through the whole development will be a winding creek and a nature trail complemented with bridges, pocket parks and bicycle lanes. Streets will be lined with flourishing trees. Open spaces will be retained at strategic spots within the village, following the constant stream of cool, mountain breeze to sweep over 38 hectares of beautiful country.